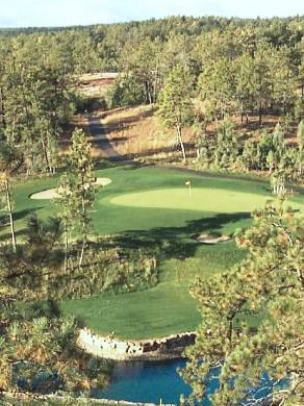 Ridgeview Country Club, is a Semi-Private, 9 hole golf course located in Chadron, Nebraska. The course first opened for play in 1969. The course has a reputation for excellent greens. They are somewhat sloped, full of subtle breaks, fast, and so firm you will have some trouble holding your shots. Water hazards come into play on two holes, and there some sand bunkers on the course. The terrain is predominantly flat, but there are some mounds which can cause uneven lies. There are some trees along the fairways and all fairways are all bordered by a standard cut of rough. Out-of-bounds stakes line seven holes. An additional set of men's tee can be used when playing an eighteen hole round. If playing a double loop 18, par for the course is 72. From the back tees the course plays to 6,749 yards. From the forward tees the course measures 5,644 yards. The longest hole on the course is # 16, a par-5 that plays to 570 yards. The shortest hole on the course is # 2, a par-3 that plays to 148 yards from the back tees. Watch out for # 10, a 426 yard par-4 challenge and the #1 handicap hole on the course. The easiest hole is # 2, a 148 yard par-3.